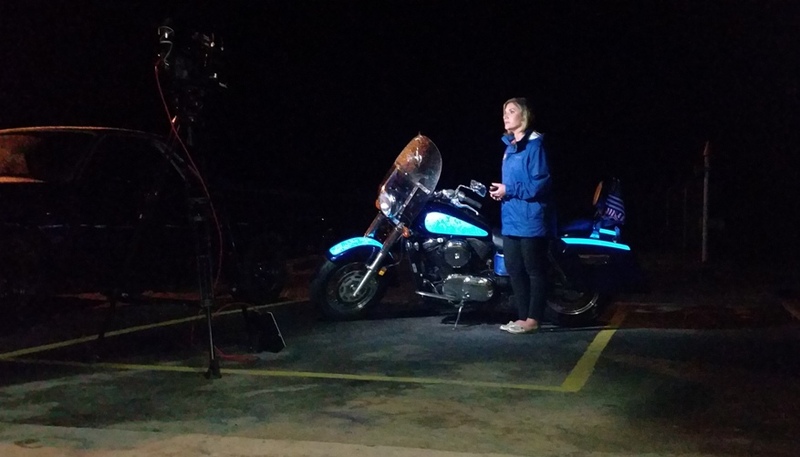 TD Customs was featured on FOX Carolina News 21 this week, showing the Asheville and Greenville communities what an excellent safety feature electroluminescent paint can be on a motorcycle. 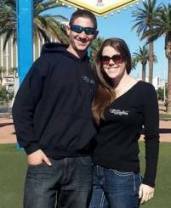 There are so many motorcycle accidents simply due to drivers not seeing the bikers out there on the roads. Increasing visibility is a big concern for many motorcyclists. Lumilor is a new paint product that lets you add light to your bike as a safety feature, as well as having a totally new way to customize the look of your motorcycle. Reporter Sarah Danik from FOX Carolina came out to interview us on the paint and how it works. We were able to get pictures and video throughout the evening and night, which showed how the paint looks in different light. When it’s pitch black out, all you see is the lit area lighting up like a bright light. We were battling the rain, so some shots were in the shop. Luckily the rain held off for the live shots outside! 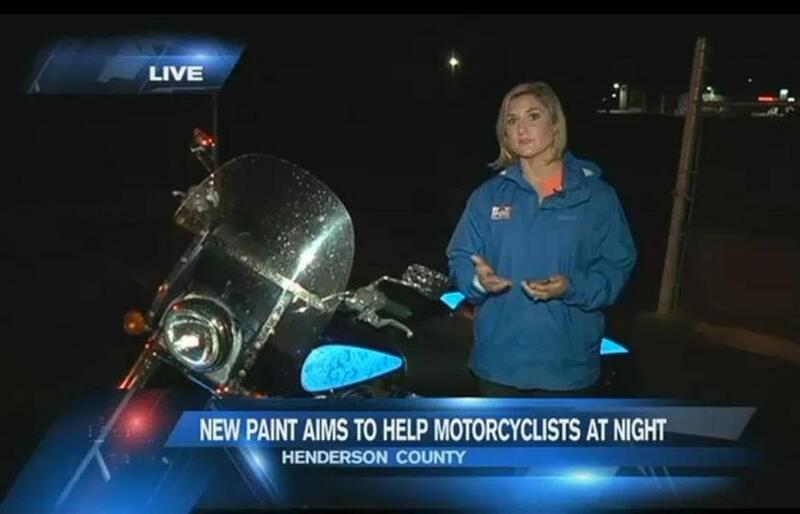 Live from TD Customs in Mills River, Danik discussed the ways having a lit up paint job can protect motorcyclists on the road. There was also a discussion about how law enforcement may look at the paint since, on our bike specifically, we’ve used the blue Lumilor. While it also comes in aqua, green, white and orange, Danik found that the consensus among the state troopers she spoke to was that the product is so new that a) they haven’t seen it yet, and b) unless a person is trying to impersonate law enforcement, there should be no issue with the added safety feature. “Electric paint” is so new that we are still raising awareness for the product itself. When we tell people it’s paint that’s lighting up, they’re always taken aback and really impressed. Tim did a great job explaining how Lumilor works, and how we wire the actual paint right into a couple inverters in the saddlebags that power it. The best part is that you can control it through a simple switch, turning it on and off whenever you want. The coverage ended up being longer than we expected, which was nice. We’re going to get the full video that aired on TV soon, but in the meantime, here is the shorter version. Since we painted our motorcycle a few weeks ago, we’ve been getting a lot of attention. It’s nice to be able to share this new paint option with everyone here in the Asheville and Greenville communities, and to get the TD Customs name out there a little more. While electroluminescent paint is the newest (possibly coolest) paint we offer, TD Customs specializes in all kinds of quality, custom paint jobs and classic car restorations. See our Photo Galleries to check out some more of our work. For the full article on FOX Carolina 21’s website, click HERE. If you’re interested in a Lumilor paint job, please fill out a Get Lit Request form to give us an idea of your project, and we can discuss. 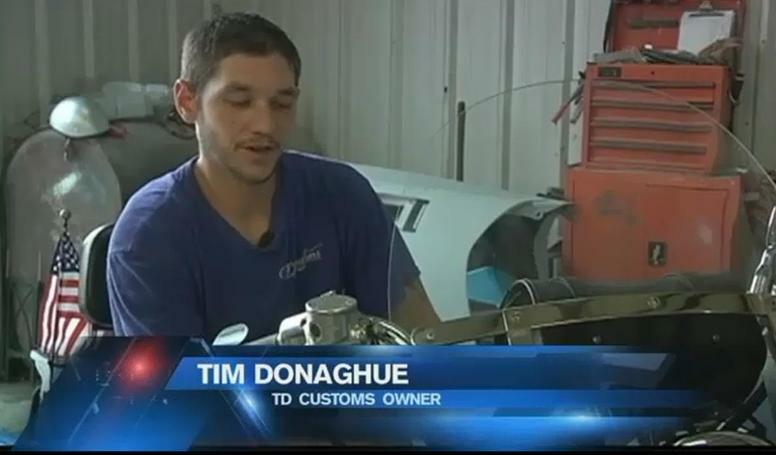 No Replies to "TD Customs Featured on FOX Carolina News!"